The 24th March is Ada Lovelace Day, an international day of blogging to draw attention to women excelling in technology. Whereas many bloggers will use this opportunity to acknowledge unsung heroines, we’ve decided to write about one of the most notable and acclaimed scientists of her age, Marie Curie (1867-1934). Born Marie Sklodowska in Warsaw on 7 November 1867, Marie moved to Paris In 1891, to study physics and mathematics at the Sorbonne. It was there she met Pierre Curie, professor of the School of Physics. They were married in 1895. Building on the work of Wilhelm Roentgen and Henri Becquerel, the Curies collaborated together in researching radioactivity. In 1898, the Curies announced the discovery of two new chemical elements, polonium and radium. In recognition of their research, the Curies, along with Becquerel, were awarded the Nobel Prize for Physics in 1903. The Curies research would have direct implications on medicine, in the development of both x-rays in surgery and in radiotherapy. Indeed, during World War One, Marie helped to equip French ambulances with x-ray equipment and even drove some of them to the front lines. Pierre died in a road accident in 1906, but Marie took over his teaching post, becoming the first woman to teach at the Sorbonne. She would receive a second Nobel Prize, for Chemistry, in 1911. 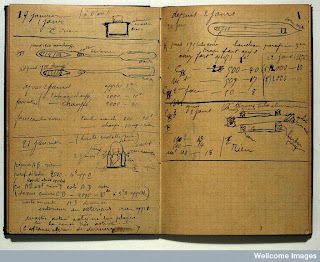 Pictured is one of the two working notebooks of Marie Curie’s that we hold. It dates from 1899 to 1902 and contains notes of experiments on radioactive substances, with rough pen-drawings of apparatus. It was purchased for Henry Wellcome’s Library collection in 1932. It has been claimed that other Curie notebooks from this period – held by the Bibliotheque Nationale in Paris – are still so radioactive that users have to sign release forms for their own safety before looking at them (other sources even claim that readers can only look at the notebooks after donning protective clothing). There are no such issues over access to the notebooks held in the Wellcome Library – merely the filling in of a Reader’s Undertaking form.